Last night was one of our most special nights of Community Week and of the summer: the Walk of Hope. Our annual Walk of Hope is a quiet, peaceful night, where campers and staff walk around Main Field following a candlelit path, and they can have time to reflect. Before our Units took to the field to walk, though, we had an incredible guest speaker named Leah Denbok. She inspired the campers one Unit at the time, showing her photographs of homeless people and telling their stories. Leah’s mother was homeless at age 3, and taken in by Mother Theresa in Calcutta, so she decided that she would dedicate herself to photographing homeless people and having their stories shared. She has traveled all across North America to photograph and brings dignity and recognition to her subjects. One of the most amazing parts is that Leah is just 18 years old, but she has raised lots of money from her beautiful book called Nowhere to Call Home: Photographs and Stories of the Homeless, and she is still taking photos and spreading awareness of homelessness in North America. If you want to learn more about Leah Denbok, or see some of her amazing photos, check out: http://www.leahdenbok.com/ ! After hearing from Leah, we watched a wonderful piece that our Video staff made, incorporating our theme of the summer ‘Caring is Community.’ It’s a fantastic video and you can watch below! Then our campers watched an amazing video about how different types of walks all over the world have changed the course of history. Our incredible Head of Tripping Rach Klein made this inspiring video and it’s posted below for all of you readers to watch! Our amazing campers were very respectful of our speakers and videos, and I was so impressed by how well they could understand that everyone deserves and opportunity, and how special the evening of the Walk of Hope is. 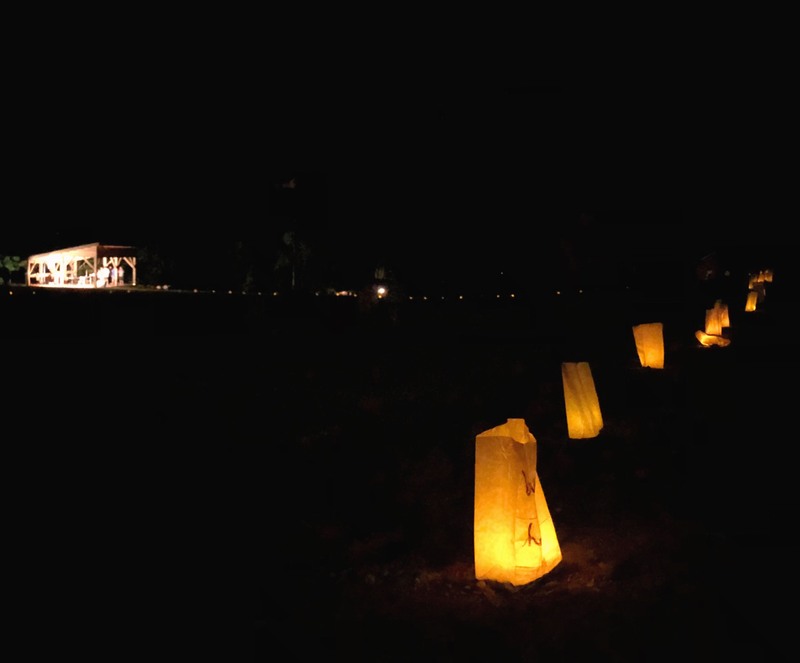 It was then time for our Units to walk around the field, and their path was lit by candles put inside beautiful bags that were decorated by our campers and staff. They had messages of hope, love, and respect on them, and I loved taking the time to look at each bag and see what our campers had written. As our campers were walking, we also had some talented artists painting windows in our Sunroom, where they could write messages of love, and we also had our musician campers playing inspirational and spiritual music. We even had some of our staff members playing at the end, and it was a wonderful way to end the night. Plus, our Senior Unit did something very special, where they spent the evening as a cabin preparing ideas of how they as a group could help the community. After narrowing down some incredible ideas, the top four cabins proposed what they had come up with to Mark and Jeff, and the best concept would receive support and time from our Manitou Cares team during the year to make their idea come to life! Last year’s idea resulted in over 200 cookies being made for the homeless youth at Eva’s! I’m looking forward to seeing what our creative campers come up with this year! Walk of Hope 2018 from Camp Manitou Foundation on Vimeo. Community Week Time Lapse from Camp Manitou Foundation on Vimeo. A Very Full Day at Manitou!